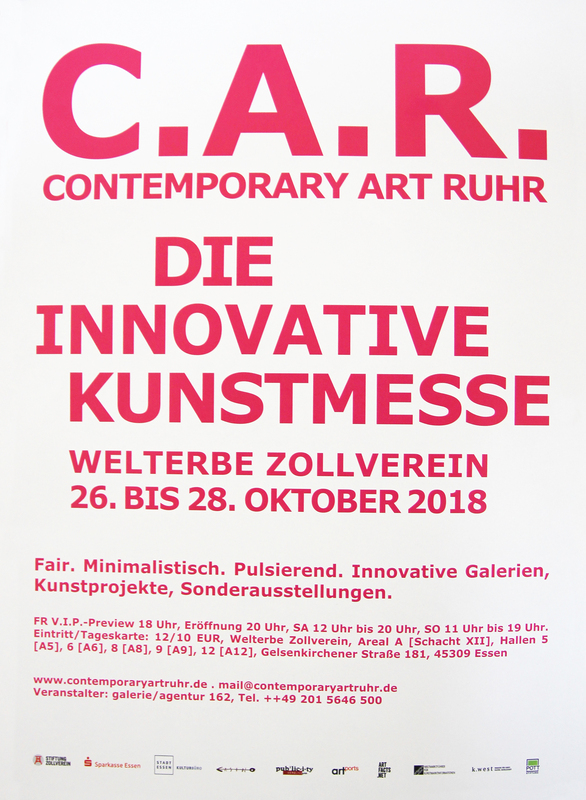 The innovative art fair is a fixed date for the international and regional art scene at the UNESCO World Heritage Site Zollverein and takes place in 2018, October 26-28, at exhibition halls 5, 6, 8, 9 and 12. Innovative galleries for contemporary art, well-known institutions, exciting art projects and a choice of selected C.A.R. new talents take part year per year. Special exhibitions, the C.A.R. Video-Lounge as well as a special program with performances and workshops complete the offered unique fair event. Friday, October, 26, 2018, Official opening, 8 pm, admittance 7.30 pm, beginning: hall 5, all exhibition halls are opened!